The PPR Process Monitoring System is designed for inline process monitoring and diagnosis. Two paths are provided to the residual gas analyzer (RGA): a high conductivity path for monitoring base vacuum, and a pressure reducing path for monitoring the process at operating pressure. The PPR Process Monitoring System is designed for inline process monitoring and diagnosis. Two paths are provided to the residual gas analyzer (RGA): a high conductivity path for monitoring base vacuum, and a pressure reducing path for monitoring the process at operating pressure. The pressure reducing path contains a micro-hole orifice which is designed to operate at one of the following pressures: 0.01, 0.1, 1 or 10 Torr. It reduces the sample pressure to the operating pressure of the RGA (about 10-6 Torr). This pressure drop is maintained by the pumping system which consists of a hybrid turbomolecular pump and a diaphragm pump. Both pumps are oil free and will not contaminate your process. 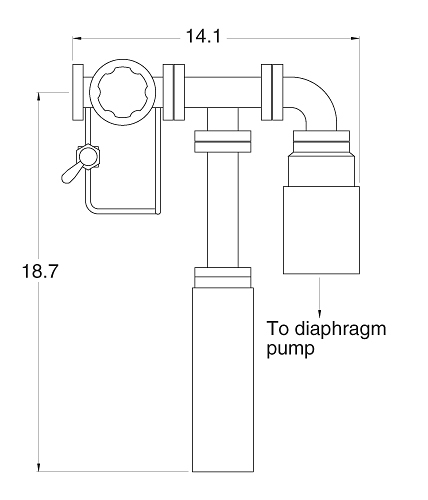 The inlet assembly that attaches to your process chamber can be configured in several ways (see drawings). The system includes an RGA, by-pass valve assembly and Tee, a controller, turbo pump, diaphragm pump, and Windows software program for data acquisition and control. The software is used to operate the instrument in various modes, including analog scan, histogram mode, and pressure vs. time mode. Both Faraday cup and electron multiplier detectors are standard with the PPR system. The electron multiplier provides additional sensitivity and higher scan speeds. The PPR system is shipped completely assembled and calibrated, and is ready to attach to your vacuum process chamber.